Is 2019 the year of the in-display fingerprint scanner? While major smartphone makers are yet to implement even the simplest form of in-display fingerprint authentication — with Apple outright rejecting the entire concept in favor of Face ID — Asian companies are having a ball with the emerging technology. While some of the biggest names in the smartphone world are yet to implement even the most rudimentary form of an in-display fingerprint scanning, Chinese companies are trailblazing the trend with ever-evolving technologies. Like regular fingerprint readers, in-display sensors were at first bound to a very small active area, but this is quickly changing. What Synaptics used to call the "phase 3" of in-display fingerprint authentication (in other words, working anywhere within the screen) is close to becoming the norm. A regular fingerprint scanner, located on the back or front of the device — or wherever else — offers some sort of tactility. You may mistake it for the camera on your recent Samsung Galaxy phone and give the lens a good swipe or two, but you'll quickly be able to move your finger to the right spot without having to look. In-display fingerprint readers, on the other hand, offer no such properties. A small, almost invisible sensor placed under a uniform glass surface with a limited active area is simply not the final solution. For this exact reason, companies are looking to expand the functionality of in-display fingerprint readers to cover the entire screen area. Chinese smartphone giant Oppo today demoed a revamped implementation of the system that is quicker to unlock and doesn't require precise presses. Xiaomi also came forward with its own take on the matter and showcased a new in-display fingerprint reader that is much more lenient when it comes to finger placement on the screen. As you can see from the video above, the phone can be easily unlocked even without looking at the screen. However, this doesn't mean that the active area of the fingerprint scanner covers the entire display. In a recent Weibo post (in Chinese), Xiaomi president and co-founder Lin Bin details some aspects of the implementation, including the usable area. According to Bin, the "unlocking area is 50.2mm x 25mm," which is far from covering the entire screen of the phone, but as shown on the video, it is much better than previous solutions. It also seems quite quick to boot, which is totally in line with the company's super-fast traditional fingerprint scanners. Reliability also seems alright, from the video at least, with no rejected attempts even when the user is seemingly blindly pressing the screen with the phone facing away from him. Lin Bin says his company has no concrete plans about launching a smartphone with a bigger in-display fingerprint reader, but hints that it may consider implementing it in a future device, provided that it is well enough received by fans. Judging by the 2,000+ overwhelmingly positive comments under Bin's Weibo post and, well, by the fact that his company actually took the time to make a prototype phone (which by the way looks very similar to the Xiaomi Mi 8), there's a good chance that the enhanced fingerprint authentication technology will make it into future phones from the brand. We don't want to say that it will happen as early as 2019, but seeing as how Xiaomi is quite quick at adopting new tech and implementing it into mass-produced products, we wouldn't rule it out entirely, either. So, what do you think of this? 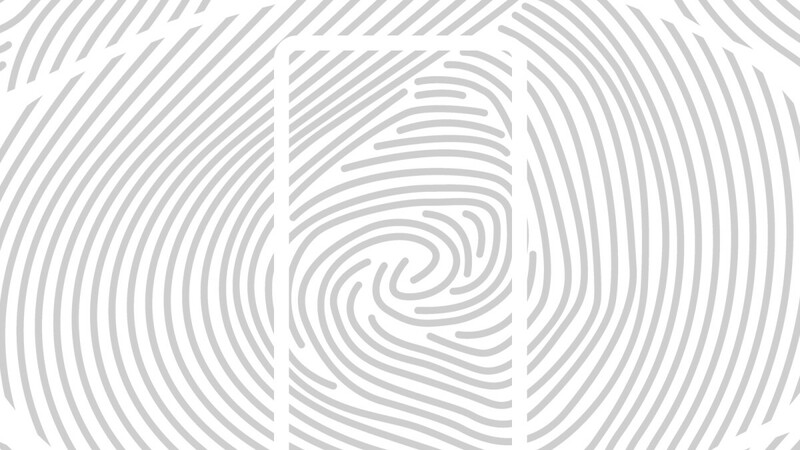 Are in-display fingerprint scanners the future, or do you think that they all forms of fingerprint reading should be dropped in favor of 3D face scanning and other methods of biometric authentication? Tell us in the comments below! Future is where you don't need to touch anything and it just happens. I have had that for over year already, but it's not perfect, if companies can improve the viewing angle more and make it even faster facial recognition is unbeatable. Facial recognition will never be as secure as proper fingerprint recognition. The larger a fingerprint recognition area becomes, the more secure it gets. Add 3D depth scanning with the ultrasonic technology to that and it gets even more secure. Facial recognition has to work with obstructions, facial changes and more algorithms that make it less reliable and secure. Facial recognition will never be unbeatable. Exactly this. There aren't any unique identifiers in facial recognition that make it secure unless iris is also incorporated into the 3d scan. So true Face ID is not as secure as FPS . But as long as apple does face ID apple fans wont admit it. As soon as apple does go to under the screen FPS it will be the best thing ever. I don't really care if its under the screen, on the back is just fine with me. Well the first smartphone to arrive with the new 3D Sonic Sensor from Qualcomm is the Galaxy S10. We will see how well that works. Until it arrives, Face ID is the safest biometric unlock method. Except it isn't. So you consider Face ID more secure despite complete strangers being able to unlock your phone just because they look a lot like you? I call bulls**t on that. A fingerprint has a 1 in 66million chance of finding another person that matches your fingerprint, Apple's Face ID has a substantially lower rate, not even 1 in a million. How is that more secure? Add to it that there are several algorithms that decrease the security as well. With very few exceptions, even identical twins are recognized by FID, so what you say never happened. According to Apple, FID has 1/1 mil risk (and only with identical twins - which has been proven already) while TID has 1/25k; if you have other facts, I'm more than willing to look through them. As far as I know you have to turn the screen on, then swipe the screen up, that's far from not touching anything to happen and still more touches than just putting your finger on a regular fingerprint scanner, also you have to hold it in a specific position. I hope not. I don't want a fp scanner embedded in my phone screen. Pretty soon we won't have any more options... everyone will be forced to submit biometric data. You can choose not to use it. Unfortunately, you have NO CHOICE but use it once you are jump on the bandwagon, remember we are specie do better as a whole. We get to vote with our dollars, and I'm voting yes to indisply scanners and no to face recognitions. And I thinks it's not only me , China has spoken no face id crap they stop buying iphone push into totalitarianism. And I hope other people will wake up and do the same. As always, I prefer to have the phone unlocked as I pull it out of my pocket, not having to wait until its out for facial rec to kick in. Smart lock has enabled this for a couple of years already but a widespread fps in screen will make it near perfect. I'm a fan of an actual external fingerprint scanner. I wonder how well it will work if you drop your phone and the glass cracks/shatters? It does provide interest in the device, especially if you were the first to implement the feature, though. Looks like the tech is almost ready. Good job Xiaomi. Last year was, This year others are just playing catch up.